Good day for the Columbus Zoo? Or is going to rain? I am trying to keep up with ‘365 Things To Do In Columbus Ohio’ on Facebook. I thought people would throw things out and I would not have to. And I did not think of it as having to do one a day, but I am. BIGDOG3c is a Central Ohio resident. 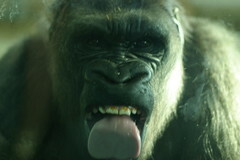 Thanks to BIGDOG3c for sharing his photo of the Gorilla at the Columbus Zoo licking the window. Thanks for sharing it with a Creative Commons licence. BIGDOG3c has lots of great animal photos and more. Lots of photos of the Columbus Zoo and The Wilds. #55 of '365 Things To Do In Columbus Ohio' is vist the NEW Columbus Zoo' Polar Exhibit starting Thursday May 6, 2010! The return of the polar bears.